Waaah I got mentioned! XD *gets back composure* I really like what you di with the original scan. Not only did you recreate the scene, while adding on lots of details (like the moss on the rocks and the delicate water ripples), but you also extended it to the left in a believable manner. The moon in the middle really ties it all together, and the black outlines of trees + grass on the left pull the composition all together. And the tree stump with the moss and other details was a perfect fit to balance out the left side. XD And finally I love the fireflies, they look way better then in the original manga art in my opinion, and I love how they POP on my desktop. Nice job! wow. This is really pretty. I admire anyone who does monochrome scans. They`re the scariest ones. I think you did an amazing job at extending the scan. The water is to die for. It's really lovely. The water and moon are a little too realistic compared to the style of the characters but that's a minor criticism. Good work! I know this story and it's also one of my favourite oneshots! You did a great wallpaper! I love how you did the moonlight beams and the water, and *stares at that mossy stump in wonder* XD Nice colour job as well, I like the fireflies floating around. Did you vector those leaves (and the bamboo) or use a brush? They're so clean :D But I think having both the bamboo and the leaves in the back are so clear kinda messes the perspective a bit, since I think the bamboo is supposed to be in front of the leaves, and there's some distance between the two. Since the focus is more towards the back, maybe blur the bamboo a bit? anyways i think the bg is really amazing, the bamboo and the trees and the water. even the light and glow behind them is very serene. i do wish i could say the same about the characters though i think i would have preferred them to be sharper. or the bg more painty. 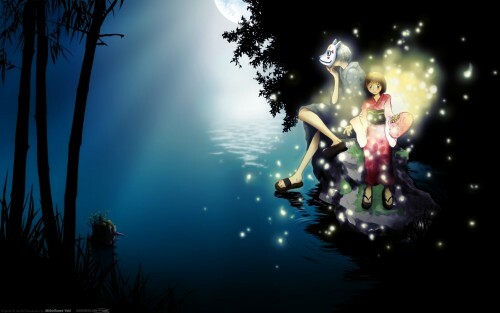 omg natsume.. thx 4 the pic.. LF> a long tym le..
Too bad about the quality but the idea was brilliant. Cheers.